Here are some of comments that have been left by Muslims and non- Muslims both after seeing the show in Wellington and Auckland. "Very warm, very funny and you broke my sterotyped view of Muslim non- humour for ever. Thanks." --- Signed as Non-Muslim, Auckland. "I loved it. Was really funny. I love being a Muslim now. Hamdulillah." --- Aieyah Shendi, Manukau. "Your show will be totally received well in Hamilton. Can't wait for the next one" --- Lois Tarawa, Auckland. "Hilarious! Azhar (the Indian) is now officially the funniest desi after Russell Peters. One thing though. Could you also talk about Muslims who leave the faith cos they are persecuted. i'm not sure how you will make it funny but could you. Cos its great that people are coming to Islam, but those who leave have a hard time & and its never talked about!" --- Froilan Savio & Joaquim Gomes, Auckland. "Loved the show! Thank you so much for coming to Wellington" --- Pamela Wilson. Not got your tickets for the Show on Thursday yet? Provision for Maghrib Salaat has been made in the Hamilton Room of the Brisbane City Hall for those attending the show on Thursday 23 November. Please note that very limited Wuduh facilities are available at the venue and you are advised to come prepared. DESPITE the Prime Minister, John Howard, criticising some Muslims for being "very resistant to integration", new figures show they have adapted to speaking English more quickly than other religious groups. Catholics are the religious group identified on census forms as having the highest total number of non-English speakers, while Buddhists have the highest proportion of poor or non-speakers, according to the Australian Bureau of Statistics surveys for 1996 and 2001. The number of people without English skills in ethnic and religious communities is low and has been falling for a decade. Muslim people reflect the average. In 2001, 67.4 per cent of Muslims spoke English very well or well, 12.8 per cent could not speak it well, and 4.5 per cent could not speak the language at all. Just over half of Buddhists said they could speak English very well or well, and 7.1 per cent were without English. Of ethnic groups, Aborigines had the highest proportion of people who do not speak English. The figures were revealed by the Greens, who were compiling a submission to a Government discussion paper on changing the rules of citizenship. Submissions closed yesterday. "I think what these figures say is that the comments we've seen from the Prime Minister, seeking to blame sections of the migrant community for not integrating, are wrong," said Kerry Nettle, the Greens senator and the party's spokeswoman on immigration. Andrew Robb, the parliamentary secretary to the Minister for Immigration and Multicultural Affairs, who is examining the citizenship proposals, had no comment on the findings. A spokesman said Mr Robb had received "a significant number of well-crafted, thoughtful submissions" and would consider them over the next few weeks. President of the Islamic Society of Holland Park, Abduf Gaffar (Louis) Deen, spoke to a gathering of diners at the Curry Hut in Cooparoo on Monday and explained how the Society was planning to purchase a property for the purposes of turning it into income generating apartments for the future running of the Mosque. As the target of $400,000 has not yet been reached and there was time only until Monday 20 Nov 2006 to raise this money, an emergency meeting will be held TODAY (Sunday 19 Nov) at 8.15 pm at the Kuraby Hall, Svoboda Park, Stiller Drive, Kuraby. The meeting is open to everyone who would like more information about the project or is in a position to help the cause in any form. Congratulation to Yusuf and Firdaus Surtie on the birth of their first child on Monday 13th November. Little Zaynah came in at 3.28kg and was delivered at the Logan Hospital. This is a first for grandparents AK and Ahsiya Surtie and the second for Firdaus's parents. The Queensland Government has approved funding of $325,770 to help promote the interaction of Muslim young people with the broader community. Minister for Communities and Youth Warren Pitt said the funding will go to the AL-Nisà Youth Group to employ two Muslim youth workers to work in the greater Brisbane area. “Young Muslims can often be left out of mainstream activities due to the broader community’s reluctance to embrace people from different cultures,” Mr Pitt said. “As a result they stick together and find their own activities, which can lead to them becoming socially isolated. The Muslim Youth Workers Project is an initiative under the whole-of-government Muslim Community Engagement Strategy announced last year. “The Office for Youth consulted with the Muslim community to finds out how best we could engage their young people,” Mr Pitt said. “The workers will be employed over two years. Activities and services will address the specific needs of young Muslim men and women. “The project aims to reduce the isolation and promote the inclusion and engagement of Muslim young people within the wider community, while supporting their chosen faith”, he said. Al-nisa has formed a partnership with the Multicultural Development Association and Youth Affairs National Network Queensland to assist in the implementation of this initiative. Advertisements will go out for the positions in the coming weeks. Al-nisa will be holding its first Queensland Muslim Youth State Summit at Parliament House on 12 December 2006 at which young men and women representative of the community will be given the opportunity to present their views at the forum. There are three main aims for the summit: to create a healthy arena for the 85+ participants to voice their concerns and issues which affect them as Queensland Muslim youth; to encourage them to participate in their local, national and international communities; and to develop a strategic and feasible platform of action based on key issues raised. There are more than 100 survivors of the political prisoners who were kept on Robin Island with Nelson Mandela. Catch a Fire tells the story of one of them, Patrick Chamusso, a Mozambique born worker in the town of Secunda who was arrested by South African security police and falsely accused of being involved with ANC attempts to bomb the plant. He was tortured, his wife and children were threatened and the experience turned him into a militant. He left his wife and kids without a word and went to Mozambique to train as a fighter with the African National Congress. He was sent back to infiltrate and destroy the Secunda refinery where he had been a foreman. He was captured and imprisoned for more than ten years. Shawn Slovo has written a story in which her father, Joe Slovo, appears. He was a South African communist helping train the troops for the ANC. 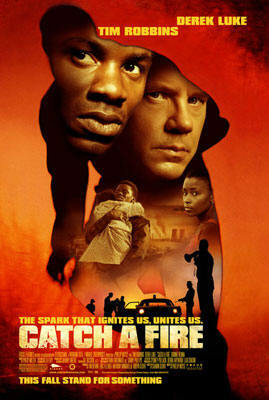 Phillip Noyce directed it, and Tim Robbins stars as the police security boss pitted against the ANC infiltrators. The film works as a thriller but one that wears its heart very obviously on its sleeve. It wants to tell a story of heroism, but also of forgiveness and reconciliation. One stance doesn't always sit easily with the other. Chamusso is played by Derek Luke (Antwone Fisher) in a performance that may well rate a mention come award season, and South African actor Bonnie Henna, born in Soweto, is compelling as Chamusso's wife, Precious. Tim Robbins plays Nic Vos, Chamusso's nemesis, a special branch colonel who uses physical and psychological torture to protect a regime he believes is just. Director Philip Noyce had his own struggles, spending months researching the struggle of black South Africans against the apartheid regime after he spent a flight from Los Angeles to Sydney reading the script for the movie, written by Shawn Slovo, the daughter of prominent ANC leaders Joe and Ruth Slovo. Joe Slovo, a former head of the military wing of the ANC and a cabinet member in Mandela's government, had told his daughter years ago that if she ever wanted to write about the ANC's armed struggle against apartheid, then the story of Chamusso was the way to go. Noyce, who first travelled to South Africa in 1995, understands the country still has many socio-economic problems that seem almost overwhelming. But he's enamoured with the changes that have already occurred. "The biggest change is that you speak to teenagers and you'll find that they don't have any limits on their imagination, black particularly. They can dream and their dreams will come true," he says. Along with the production time on the set of Catch a Fire, Noyce spent nine months in South Africa researching the story of the film and was back in the country again last weekend. "I was struck by the pride of all South Africans in the new democracy they've created, black and white South Africans," he says. "I spent a wonderful afternoon just watching parliament on television, a parliament that debates in 11 languages and is a real living example of the pluralistic democracy that they've got there." When Catch a Fire opened in America, much of the reaction examined the film through a post-9/11 context, focusing on the distinction between freedom fighters and terrorists. Noyce says former British prime minister Margaret Thatcher denounced Nelson Mandela as a terrorist, while the British called the Americans terrorists in the War for Independence. There are, he says, many lessons from the South African struggle that apply to a wider, and current, context. "There's no comparison to be made between today, with what we call terrorists, and the struggle for freedom in South Africa except the very fundamental question we should all be asking: What causes a man or a woman to feel that they have no other way of prosecuting their political aims except through the use of force? "Because that's a fundamental question that we need to understand if we are ever to win this war, absolutely fundamental. "And we can certainly look back in South Africa's history and know that the nail in the coffin of apartheid, the first nail, was the first time that they fired on black protesters. "That was the beginning of the end. Oppression will never achieve your aims – you'll only enrage people and put them in touch with the core of humanity, which is to resist." You can catch Catch a Fire at most local cinemas this week. Last Sunday some 150 men women and children attended the first Brisbane Salatul Istisqa - a special prayer for rain on the sports field of the Australian International Islamic College AIIC (formerly, Brisbane Muslim School). Imam Peer of the AIIC delivered an impassioned plea for rain and Moulana Shazad Khan, Imam of Darra Mosque, the Khutba. In keeping with the tradition of the occasion, the prayer was performed with everyone having to turn their clothes around and wear them back to front and upside down. CCN's Man-on-the-Mussalah was so taken with Helping Hands Queensland's exotically flavoured ice cream at Eidfest that he went in search of the members of the fledgling organization to learn what their "secret herbs and spices" were under the pretext of finding out more about the organization and its raison d'être. [MotM] When did you start "Helping Hands Queensland" and how and why did you start it up? [S&R] About two months prior to Ramadaan, over a cup of coffee, we had the idea of donating hampers to needy families as an Eid gift. We thought this was a worthy cause, and while many Christian groups raise money and collect items for needy families at Christmas, there was no similar initiative within the muslim community. During Ramadaan, we came up with the idea of selling ice-creams at EidFest. We all thought this was a great way to raise the money, and from on then started to make arrangements to produce and sell the ice-creams. We thought that the name "Helping Hands Queensland" was appropriate for our cause, and are currently in the process of registering ourselves as a non-profit organisation. [MotM] What are the immediate plans for the group? [S&R] All profits from the sales of our ice-creams will go to providing items of need to refugees. We are in the process of gathering information regarding those families and individuals who would most benefit from this assistance. It is obviously too late to provide this as gifts for Eid-Ul-Fitr, but hope to provide them by Eid-Ul-Adha. [MotM] What are the long term plans for the group? [S&R] We see many needs for an Islamic-based non-profit/charity organisation for the purpose of providing social and financial support within the Brisbane Muslim Community and for providing financial aid abroad. With regards to refugee families, many of whom are Muslim, there is little in the way of Islamic-based social and financial assistance. It is sad and shameful that many Muslim refugees need to turn to other religious organisations for this need. We would like to let refugee families know that there is a Muslim community in Brisbane and perhaps provide them with assistance such as a directory of services (eg butchers, upcoming Islamic events), and relief funds for when they most need it. We also think there are various facilities required in our community which might help us be more united as Muslims. We have brought up the idea of a place where Muslim youth might be able to get together for example at a hall with a pool table etc. We hope that if this idea is realised, that it would provide a safe environment for our Muslim youth in which to socialise. We also believe there is a need to provide living facilities for our elderly. Islam teaches us to care for our elderly, and yet Muslims are the only religious group who do not offer a supported retirement living arrangement for elderly. We have many elderly people in our community who either live alone or might choose the option of a Muslim retirement village if given that option. Of course there are always needs for relief funds overseas. And, as mentioned we hope to support these as well. [MotM] Have you set up any formal structures for the group? [S&R] No, not really. We are currently just two couples trying to make a contribution to the Islamic community. As mentioned, we are in the process of obtaining registration as a non-profit organisation. Obtaining our goals, both long and short-term, will require a lot of effort and a lot more than just a few ice-cream sales. However, each small step helps towards achieving these goals and surely the rewards will be great. [MotM] One final question, Sisters. How do you make your ice cream so delicious? [S&R] We could tell you brother. But then we would have to kill you! [MotM] Make that another Tennis the Menace to go, jazakallah, Sister. If you share the interests and goals of HHQ and would like to offer them your help and support contact either Shenaz Seedat by e-mail: shenaz_seedat@hotmail.com or on H: 3342 2992, M: 0415180065 or Raeesa Gutta on H: 3219 7068 M: 0405230305. And what a war it was! Last night was the clash of two well known Queensland Muslim families. What was originally planned as a friendly football match between the Brisbane based Deens and the Cairns based Mohammeds, was in fact anything but amicable. The Deen Machine Team included members of the prominent Deen family, originating from Darwin, while the more far reaching Mohammed team, stemming from the cane farms of North Queensland also included members of the respected Rane, Goss and Khan families. The families arrived early to set up their respective camps, and practice their cheer leading. After Magrib salat on the field, a quick team warm up, and the customary team photos, we were ready for kick off. With many months of training behind them, named jerseys finally on, the boys ran on to a rambunctious welcome even the Broncos would have been proud of. The teams lined up and the crowd stood as Imam Uhzair lead the dua, and family prayed for fair play and no broken bones. The idea that a decent football team could be made up from a bunch of unfit, but no doubt determined young men, some who had not played football for a whole generation, was laughable. With some members of the Mohammed team only arriving in Brisbane 24 hours before the match, their training was done on the cane fields of Innisfail. There was no way this was going to be a respectable game of football. The families, as proud as they were, secretly were looking forward to a comedy of errors. However, the polished football produced left most of us in awe. The crowd quickly grew, with many coming to witness their first game of football, and the excitement of actually knowing someone on the field. Both teams had a strong cheer squad, and the excitable crowd was at times perhaps getting too much into the spirit of the game. The Mohammed team drew first blood, scoring first, and then leading all game, making it difficult for the Deens to make a comeback. When the full time whistle blew at 32-10, the crowd was whipped into a feverish frenzy. As the trophies were awarded, the organizers guaranteed that this successful match was only but the first in many more to come. The organizers deserve to be congratulated on the positive outcomes of the evening. MAKKAH, Saudi Arabia — Timeshare, a concept more usually associated with Torremolinos and the Algarve, has spread to Mecca. Built by the Binladin Group the ZamZam tower offers five-star accommodation, a shopping centre, restaurants and a car park. Saudi authorities will use the initial revenue to maintain the holy site, but there is nothing to stop homeowners from selling or subleasing their timeshare prices. A week's lease on a 33 square metre studio with city views costs $6 000 in low season. A studio with views of the Ka'bah costs $177 000 to lease during the month of hajj. 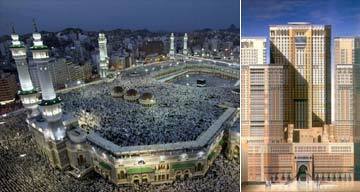 The Saudi government allowed the towers' construction to cater for Mecca's growing popularity as a year-round destination. Around four million people visit during hajj and three million visitors during Ramadan, but many Muslims visit at other, quieter times of the year. The Saudi government does not object to expanding facilities in Mecca. Like his mother used to!!! At Australian International Islamic College (AIIC) held its Annual Fete yesterday at the Durack campus. While it was obvious that a great deal of preparatory work had been put up to setting up the fete it was disappointing to find that the event was not supported by the community to the extent that it might have. How much do you know about Australian identities. With the holiday season around the corner, you might be considering ways and means of saving on travel costs. Each week CCN will provide you with a tip sheet on how to save money courtesy of http://www.simplesavings.com.au. This week we have some Travel Tips for you. I am an item for whom men have gone to the ends of the earth, fought wars and I have become indispensable to the food industry. You will find me in your home. Do you know me? (a) I am flavoring from the dried leaf of the evergreen tree, “Laurus nubilis” also known as sweet bay or laurel tree. Slightly bitter but sweetly fragrant, I am native to Turkey and Portugal, and very popular in meat, soup and stew. What am I? Yes! You are correct…..I am BAY LEAVES. (b) I am very well-known and found in Tanzania, Madagascar and Indonesia. From the unripened bud of the tree “Eugenia carophyletta thumb”. I am very strong and pungent when used in whole form in relishes, marinades and sauces. In ground form I am used in cakes, cookies and meat sauces. You must know me. What am I? You must know me…I am CLOVES. I am writing from USA and I am looking for one Br. Firoze Ali Adam who used to teach in Darul Uloom Newcastle (South Africa). We both studied in Islamic University Madinah and ever since he left (which is a long time ago) I have been trying to find him. Can someone, may Allah SWT bless you, help me to locate him. My name is Sh.Abdur Rahman Khan originally from Guyana. Myself and Firoze were very good friends and he helped me a lot while in Madinah. I really would appreciate if someone can give me a contact number of him. 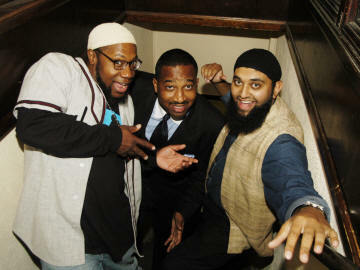 My email addresses are: akhan@ifsvp.org or abdool786@aol.com or shaykh@islamicfoundation.org. George W Bush (the latter day Mulla Nasruddin) is asked to make a speech at the opening of the Olympic Games. "Ooooo, Ooooo, Ooooo, Ooooo, Ooooo," Bush says reading from the page in his hands. An aide rushes over and whispers, "Mr. President, those are the Olympic rings. Your speech starts underneath".